Wonder Woman is a fictional character appearing in comic books published by DC Comics. Wonder Woman was created by American psychologist William Moulton Marston and first drawn by H.G.Peter. The character first appeared in All Star Comics #8(December 1941) and made her first cover appearance in Sensation Comics #1(January 1942). 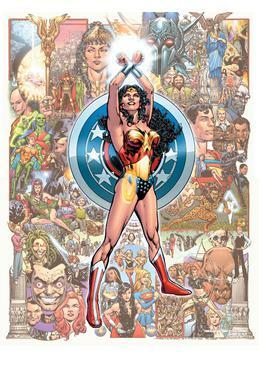 Wonder Woman is considered to be a feminist icon. Wonder Woman was sculpted from clay by her mother Hippolyta and received her superhuman powers from Olympic Deities, these powers combined with her Amazon training helped to develop a wide range of skills which makes a fierce warrior.On Paradise Island, she goes by her name Diana. She possesses an arsenal of weapons including a Sword, a Shield, The Lasso Of Truth, a pair of Indestructible Bracelets and a Tiara which she uses as a projectile. Wonder Woman made her first cover debut in Sensation Comics #1(January 1942). After the events of The Darkseid war,Wonder Woman is told by the dying Myrina Black that on the night of her birth, another child was born. This child was revealed to be male, known as Jason, and is said to be incredibly powerful. Wonder Woman makes it her mission to find him. Wonder Woman has a wide range of powers including superhuman strength,speed, agility, durability, endurance, reflexes, longevity, flight and is a master of hand-to-hand combat. Wonder Woman is one of the most powerful characters of the DC Universe. She can fight toe-to-toe against Superman. The combination of her powers and her Amazonian training makes her a force to be reckoned with. Wonder Woman is depicted as a masterful athlete, acrobat, fighter and strategist, trained and experienced in many ancient and modern forms of armed and unarmed combat, including exclusively Amazonian martial arts. Batman once called her the "best melee fighter in the world". She has an arsenal of powerful God-forged weapons at her disposal, but her signature weapons are her indestructible bracelets and the Lasso of Truth. Wonder Woman has a number of allies including Steve Trevor, Etta Candy, her mother Hippolyta and Wonder Girl:Donna Troy. Wonder Woman on occasion teams up with Superman or Batman and being one of the founding members of the Justice League, she asks them for help. Wonder Woman has made many enemies over the years. The enemies of Wonder Woman are a diverse bunch, and range from thieves to spies to Gods. The majority of her foes are women, and the only "official" union, Villainy, Inc., is all-female, though Doctor Psycho has a long history of teaming up with other villains. Some of them are Angle man, Cheetah, Circe, Ares, Dark Angel, Decay, Doctor Cyber and Doctor Psycho. Wonder Woman was an American TV series based on the character. It starred Lynda Carter as Princess Diana/Diana Prince. Wonder Woman aired on two American networks between 1975 and 1979. During its original run the series was extremely popular. It is also the title of a TV movie starring Cathy Lee Crosby, loosely based upon the character, that aired in 1974. After almost 37 years, Wonder Woman returned to the big screen. This movie featured Gal Gadot as Wonder Woman, Ben Affleck as Batman, Henry Cavill as Superman, Jesse Eisenberg as Lex Luthor and Jeremy Irons as Alfred Pennyworth. When Gal Gadot was cast as Wonder Woman, many fans were disappointed saying that she didn't have the physique to play the character,but when the movie released fans were delighted and extremely satisfied with her performance. Wonder Woman is an upcoming movie and will be the fourth installment in the DC Extended Universe. Wonder Woman features Gal Gadot reprising her role as Wonder Woman and Chris Pine as Steve Trevor. You can check out a teaser below. You can check out our Wonder Woman products here.